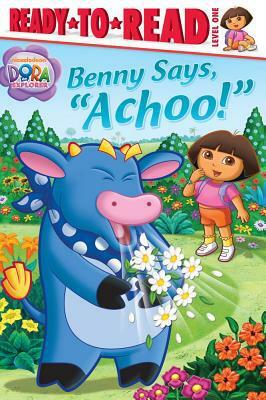 Can Dora help Benny find flowers that don't make him sneeze? In this Level 1 Ready-to-Read, Benny wants to do something special for his grandmother on her birthday. He knows she loves the flowers in Isa's garden, so he sets out to collect a bouquet -- but he can't stop sneezing! Benny is allergic to flowers. So instead of gathering real flowers for Grandma's birthday, Dora convinces Benny to make a beautiful bouquet of paper flowers that will last a long time -- and won't make anyone sneeze! Grandma will love that Benny made them just for her!